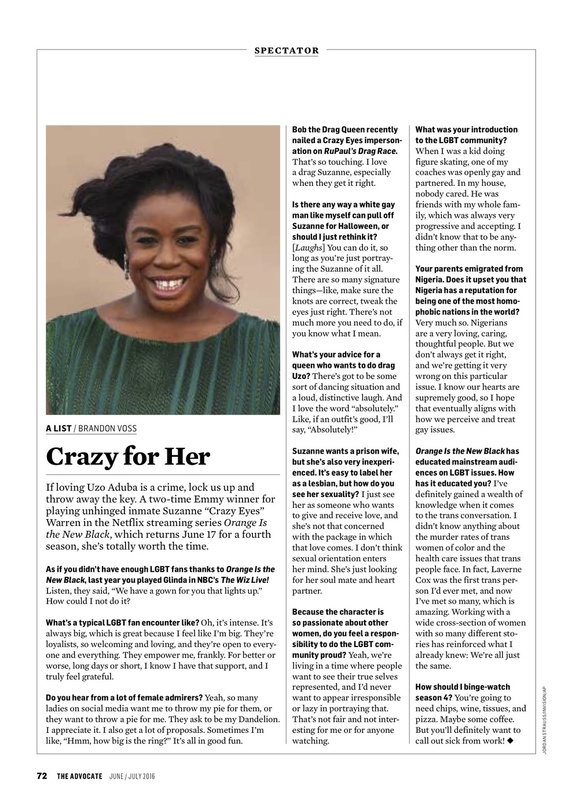 If loving Uzo Aduba is a crime, lock us up and throw away the key. A two-time Emmy winner for playing unhinged inmate Suzanne “Crazy Eyes” Warren in the Netflix streaming series Orange Is the New Black, which returns June 17 for a fourth season, she’s totally worth the time. 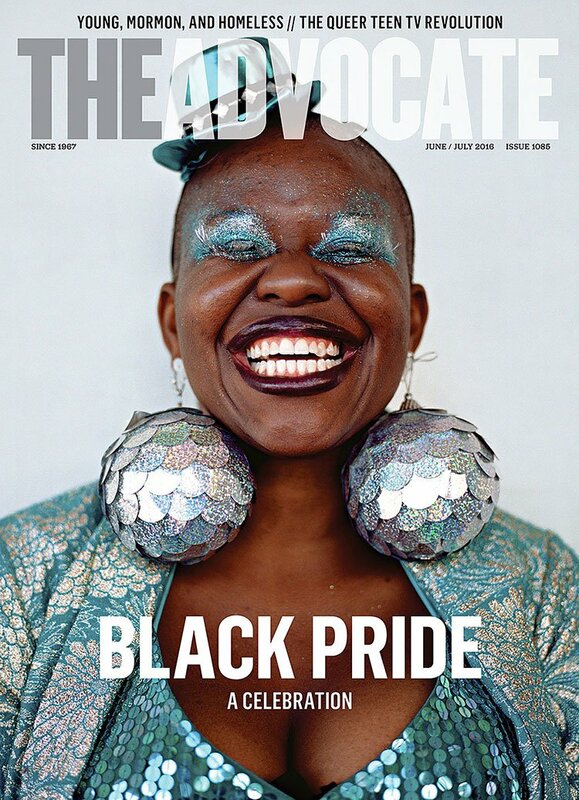 The Advocate: As if you didn’t have enough LGBT fans thanks to Orange Is the New Black, last year you played Glinda in NBC’s The Wiz Live! Uzo Aduba: Listen, they said, “We have a gown for you that lights up.” How could I not do it? What’s a typical LGBT fan encounter like? Oh, it’s intense. It’s always big, which is great because I feel like I’m big. They’re loyalists, so welcoming and loving, and they’re open to everyone and everything. They empower me, frankly. For better or worse, long days or short, I know I have that support, and I truly feel grateful. Do you hear from a lot of female admirers? Yeah, so many ladies on social media want me to throw my pie for them, or they want to throw a pie for me. They ask to be my Dandelion. I appreciate it. I also get a lot of proposals. Sometimes I’m like, “Hmm, how big is the ring?” It’s all in good fun. Bob the Drag Queen recently nailed a Crazy Eyes impersonation on RuPaul’s Drag Race. That’s so touching. I love a drag Suzanne, especially when they get it right. Is there any way a white gay man like myself can pull off Suzanne for Halloween, or should I just rethink it? [Laughs] You can do it, so long as you’re just portraying the Suzanne of it all. There are so many signature things — like, make sure the knots are correct, tweak the eyes just right. There’s not much more you need to do, if you know what I mean. What’s your advice for a queen who wants to do drag Uzo? Suzanne wants a prison wife, but she’s also very inexperienced. It’s easy to label her as a lesbian, but how do you see her sexuality? I just see her as someone who wants to give and receive love, and she’s not that concerned with the package in which that love comes. I don’t think sexual orientation enters her mind. She’s just looking for her soul mate and heart partner. Because the character is so passionate about other women, do you feel a responsibility to do the LGBT community proud? Yeah, we’re living in a time where people want to see their true selves represented, and I’d never want to appear irresponsible or lazy in portraying that. That’s not fair and not interesting for me or for anyone watching. When I was a kid doing figure skating, one of my coaches was openly gay and partnered. In my house, nobody cared. He was friends with my whole family, which was always very progressive and accepting. I didn’t know that to be anything other than the norm. Your parents emigrated from Nigeria. Does it upset you that Nigeria has a reputation for being one of the most homophobic nations in the world? Very much so. Nigerians are a very loving, caring, thoughtful people. But we don’t always get it right, and we’re getting it very wrong on this particular issue. I know our hearts are supremely good, so I hope that eventually aligns with how we perceive and treat gay issues. Orange Is the New Black has educated mainstream audiences on LGBT issues. How has it educated you? I’ve definitely gained a wealth of knowledge when it comes to the trans conversation. I didn’t know anything about the murder rates of trans women of color and the health care issues that trans people face. In fact, Laverne Cox was the first trans person I’d ever met, and now I’ve met so many, which is amazing. Working with a wide cross-section of women with so many different stories has reinforced what I already knew: We’re all just the same. How should I binge-watch season 4? You’re going to need chips, wine, tissues, and pizza. Maybe some coffee. But you’ll definitely want to call out sick from work! The Advocate, June/July 2016 issue.